Please join us! 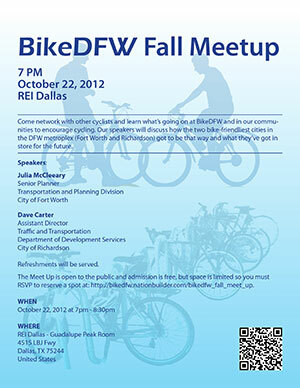 BikeDFW’s Fall Meet Up will be on Monday evening, October 22, 2012. Come network with other cyclists and learn about what’s going on at BikeDFW and in our local communities to encourage cycling. Our speakers will discuss how the two bike-friendliest cities in the DFW metroplex (Fort Worth and Richardson) got to be that way and what they’ve got in store for the future. Short presentations by the Fort Worth Mayor’s Office (MaryAnn Means) and Bike Friendly Fort Worth on grass roots advocacy. The Meet Up is open to the public and admission is free, but space is limited so you must RSVP to reserve a spot. Some folks from Richardson will be riding to the event. They will be meeting at the Kroger parking lot, at the northeast corner of Coit and Beltline at 6:00. Check the BFR Facebook page for details and updates. I was going to complain about the unfounded ascertain that Ft Worth is more bike-friendly than Dallas. Then I read about the bickering going on in the city council over the proposed safe passing ordinance. If even our most pro-bike councilperson doesn’t support the sharrows downtown, we must be in trouble.